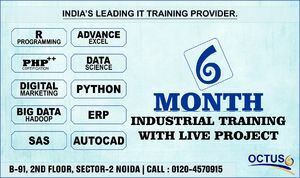 Octus Technology is a Best Institute for 6 months project based Industrial Training in noida. It is an applicable preparing space for B.Tech/BE, M.Tech/ME, BCA and MCA students. We provide Technical/Industrial Training for CSE and IT branch students. This preparing will supports student's career after their graduation, to enhance their skill in which field they want to consider as their successfully profession.